Last week, I wrote about my experiences as a left-handed person playing The Legend of Zelda: Skyward Sword. To save you the re-reading, I'll let you know that I survived. I had some trouble playing the game, which seemed tailored for righties, but I got used to it. Some readers, however, wondered if there was a lefty mode. Some even pointed to an IGN report that stated that there is one. I was surprised that none of the Nintendo reps who sat with me while I talked about the game's compatibility for left-handed people had mentioned a lefty mode. None of them was a developer on the game, but they were knowledgeable folks nonetheless. I e-mailed Nintendo public relations to be sure and even linked them the IGN video, which makes verbal mention of it but doesn't show it, to make sure we were talking about the same thing. Now I've got an official response: Nintendo confirms there's no left-handed mode in the game. Go figure. This is no tragedy. What it means, I guess, is that Link will hold his sword in his right hand as he did in the Wii version of his previous Zelda console game. Prior to that, he'd been a lefty in all of his most famous games. 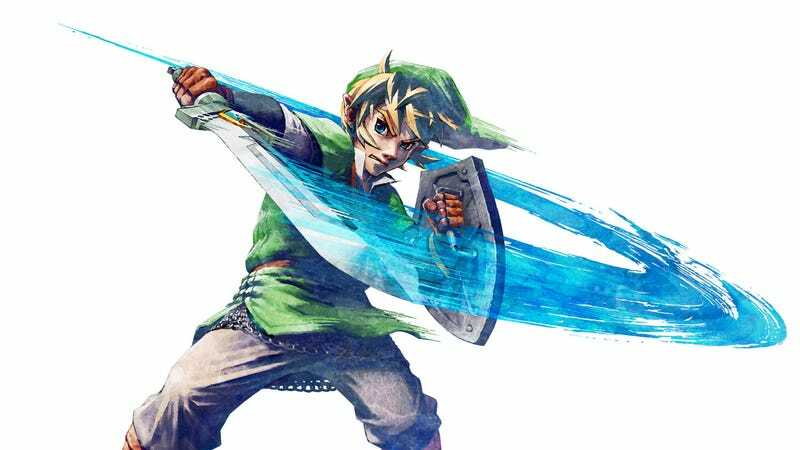 This lefty/righty thing is an issue because Skyward Sword requires players to use a Wii Remote with Motion Plus to swing hero Link's sword with finesse, the kind of finesse a left-hander like me might not feel when wielding the Remote in one's right hand. This wasn't an issue with the previous Wii Zelda, Twilight Princess. That game tolerated cruder, less careful gestures and had a more limited and less interesting move-set as a result. A lefty like me could easily just put the Wii Remote in their left hand to play Skyward Sword, but that forces the Wii's Nunchuk to go in the right hand, and makes you move the character with your right thumb on the Nunchuk's thumbstick. That configuration had felt unnatural when I tried it. I didn't like it, but some Kotaku readers said that they might want to play Skyward Sword with the Remote in their left hand... as long as the game would put Link's sword in his left hand. That's what this lefty mode would have been, but it's not in there. Without the lefty mode, Link will keep his sword in his right and the player will simply have to decide which hand to put the Remote in and which will wield the Nunchuk. I'm putting the Remote in my right.